Type 1 diabetes, endurance sport and the LCHF approach: Lewis’ story. I first met Lewis about a year ago when he came in to see me for a consultation. He will explain his story below, but the crux of it was that he wanted to ensure he was on the right track with his food intake as he started on a low carbohydrate, high fat (LCHF) diet to help his blood sugar control and his endurance sport. In reality, I merely confirmed what Lewis was already doing. Lewis had some trouble finding a lot of information for people with type 1 diabetes who undertake endurance sport, so felt the more he could share his experience, the better it will be for others looking to transition to a low carbohydrate, high fat diet for their blood sugar control. Despite what you may believe, it is not dangerous to follow an LCHF approach to diet if you have diabetes (type 1 or type 2). In fact, it’s quite the opposite. Thanks, Lewis, and over to you. I was diagnosed with Type 1 diabetes 30 years ago, aged 9 years. I have always been a well-controlled diabetic, (according to the ‘diabetes guidelines’). About 3 years ago, I started training daily. 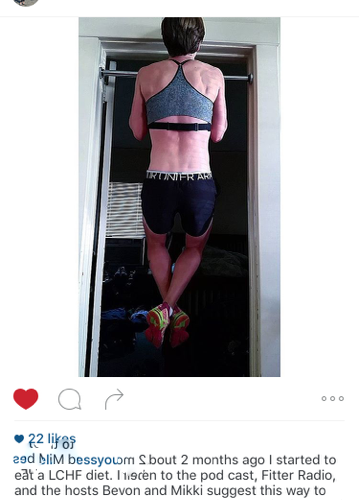 It started out being just gym, then moved on to training for triathlons. Doing exercise is a vital part of a control plan for someone with type 1 diabetes, but it isn’t always easy to balance the amount of sugar, exercise and insulin. It is this balance between the amount of sugar, exercise and insulin that they call the ‘three legs of a stool’. They all are vital, and without any one of them, the chair will fall over. I try and keep my sugar levels above 4 and below 8 mmol/L, what is considered ‘normal’ and is typically controlled by the body’s natural hormonal processes in a person without diabetes. What I found as I was training was that I was having to supplement large amounts of glucose whilst exercising to stop my sugar dropping. Then, after the exercise, my sugar levels would sky rocket to 15 mmol/L or higher. I would have to take extra insulin to counter the extra high blood sugar, and that would drive my sugar right down low again. It is this extreme roller-coaster of sugar levels that I interpreted as being necessary if one wanted to participate in endurance training. I would typically require a Gu gel every 20 – 30 minutes to stop my sugar dropping. On a four hour bike ride, that would be a massive (and expensive) 8 Gu gels, taking in approximately 160g of carbs. My sugars would be ok during the ride but then would skyrocket afterward. Also, I had no confidence what my sugar level at any one time would be. If it was in the “good” range, was it only temporary? Was it on its way up, or on its way down? After having diabetes for 25 years, I still had no idea at all. I was thin, muscular, getting fitter and fitter. But my sugar levels were extremely erratic. I was pre-occupied with food, and was always hungry. I watched a Youtube clip of Dr Troy Stapleton, an Australian doctor who developed diabetes and eats LCHF. He said his inspiration was Dr Richard Bernstein’s Diabetes Solution. I read that book, and it pretty much changed my life. Dr Bernstein is an engineer who was diagnosed with Diabetes in the 1950s. He was the first person to do “home glucose monitoring” and turned the industry on its head, saying patients needn’t go to hospital to check their blood sugar. He later became a doctor (in his 40’s) to specialise in diabetes, and further the cause for good blood control. He was, and remains, and engineer at heart. His basis for blood sugar control is one only an engineer could come up with. In a nutshell, you can’t predict what your sugar level will do. You can’t get the balance right between sugar and insulin. You will always be wrong. If you happen to be right, it is only by accident. He was describing me, and my rollercoaster sugar control. He explains that if you don’t eat carbs, then you don’t need as much insulin. If you don’t take as much insulin, then you don’t need as much carbs. I switched to LCHF in October 2013, and did my first Half Ironman in Jan 2014. I had submitted a detailed race report to Grant about this race. Fast forward a year later and I have never looked back. In terms of the food, eating becomes easier and easier. I do the cooking at home, which is quite useful! My typical breakfasts now comprise an omelette with 3 eggs, chopped mushroom and chopped tomato. Alternatively, I soft boil 3 eggs, and have them with an avo and tomato salad. My typical lunch would comprise a green salad with left-overs from the night before. I take care to make enough supper to leave something for lunch the next day. Typical suppers in our house are below; it is all organic, whole food and high in fat. Spaghetti bolognaise with low carb mung bean pasta (less than 5g net carbs for a big bowl of pasta). covered with olive oil and cheese. Hamburger on a bread roll made from 1/3 cup almond flour, 1/3 cup ground linseed, 1tsp baking powder, 1 egg, 1tbsp olive oil, 1tbsp cream, 1/2tsp salt. Baked in a mini-round tin, comes out like perfect soft bread roll. Creamed mushroom soup (lots of mushrooms, cream, soup stock) served with Almond bread toasted slices. I make a large almond and linseed loaf once a week, slice it and freeze the slices for ready toast. Fish fingers and “chips”. The fish finger batter is coconut flour and seasoning. Fried in Coconut oil. The chips are the same recipe as the pizza base but rolled thinner. Baked until brown and crispy. Add salt and the kids love it. Taco night where it’s all the Mexican trimmings on either cauliflower tortillas, or large fresh crisp iceberg lettuce pieces as tortillas. I try keep the level of protein at every single meal the same. Approximately the size of a deck of cards. 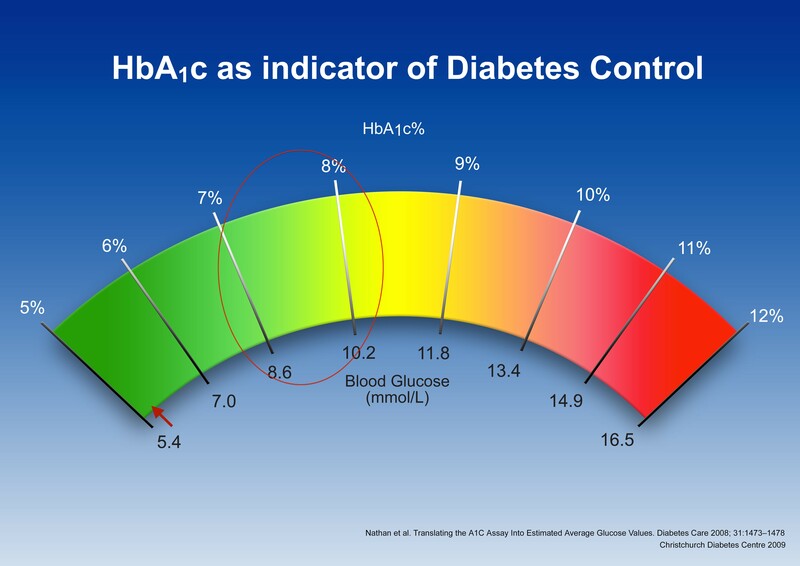 There is a test called HbA1c, which measures the average blood sugar over the last 3 months. The traditional diabetes practitioners (such as where I go at North Shore Hospital) have this range up, and the red oval shows where the practitioners try to have you aim your sugar levels. A non-diabetic is supposed to be 5%. The reason the practitioners want us diabetics to be at an average of 8-10. (which is too high, as the non-diabetic body wants to be at 5%, is that (as a diabetic) when you eat regular carbs, you blood sugar will always rise after a meal. It can rise to 10 or 12, and then come back down again. This is “normal”. So, if your sugars are always rising to 10-12 after a meal, and your average is sitting at 5, it can only mean one thing. You have many many dangerous low blood sugar hypos. I take 2 different insulin types. I take a long acting insulin called Lantis, which processes the natural sugars the body creates. (nothing to do with food). I also take a short-acting insulin (purpose made to handle carbs in food) each time I eat. My long acting Lantis dose has not really changed since going LCHF. Now, when I was eating my traditionally healthy high carb low fat diet, I was taking between 10 and 12 units of short-acting Humalog each meal. My sugar would absolutely rise after the meal, then I would more likely than not correct it, then it would fall too low. Hence the terrible roller coaster. I assumed, as does the Diabetes Clinic, that to achieve non-diabetic levels of blood sugar control, it required a lot of low blood sugar hypos. I would have had to correct my low blood sugars hypos 3 – 4 times a day. Nowadays, eating LCHF, I would typically take 1-2 units per meal. This is only for the hidden carbs in vegetables etc. If I was stricter in my eating, I could reduce that dose even further. I have since had to buy a “paediatric” insulin pen, which allows me to dose in half units. Which is quite something. My sugar never rises after a meal. Then, because I am taking very small insulin doses, it doesn’t drop down low either. My last HbA1c reading was 5.6 and then 3 months later 5.3. A cause for celebration really, as this is approaching non-diabetic levels. The Diabetes Clinic sister on duty was extremely unhappy, and had to call a supervisor. They were not happy letting me drive home. They could only deduce that for my levels to be so low, I must have been having many many dangerous hypos. I took it upon myself to explain diabetes to them. “If I take no carbs, then my sugar won’t go up. If take no insulin then my sugar won’t come down”. I can manage my sugar in a very accurate range. I have very few hypos, and when I do, their intensity to slight (ie, not powerful caused by large over-doses of insulin). And that by following their protocols, I would have many more. 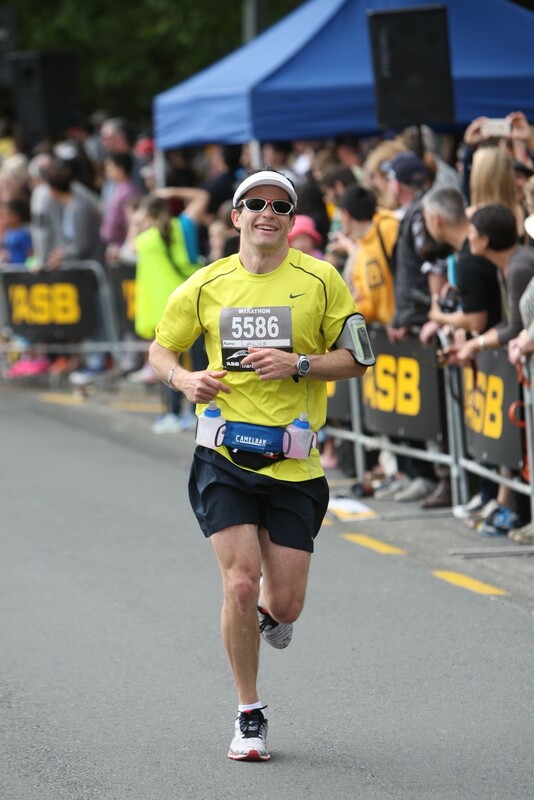 Lewis completing the Auckland Marathon last weekend (November 2nd, 2014). Note the glucose monitor on his left arm.